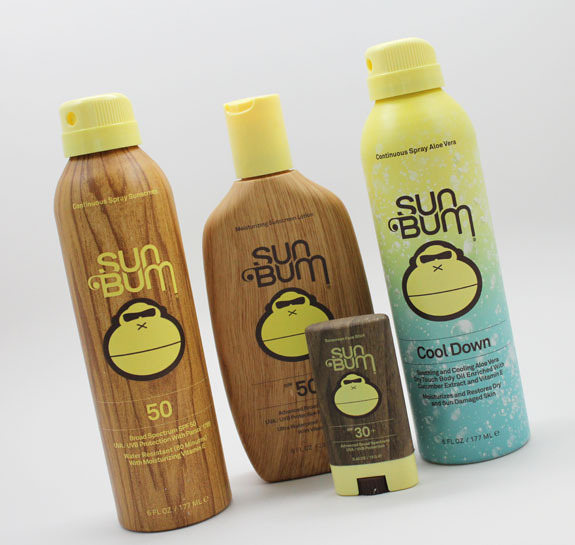 Sun Bum is a brand created in 2010 that features an array of UVA/UVB, paraben-free sunscreens. And what better place than to create this brand than in Cocoa Beach, Florida? Because I was recently in Orlando at Disneyworld for a week I thought the timing was perfect to try out a few of their sunscreens and see how they held up in the super hot, super humid (read: sweaty) weather there. And guess what? I didn’t get even a wee bit darker or burned, which proves they really work! 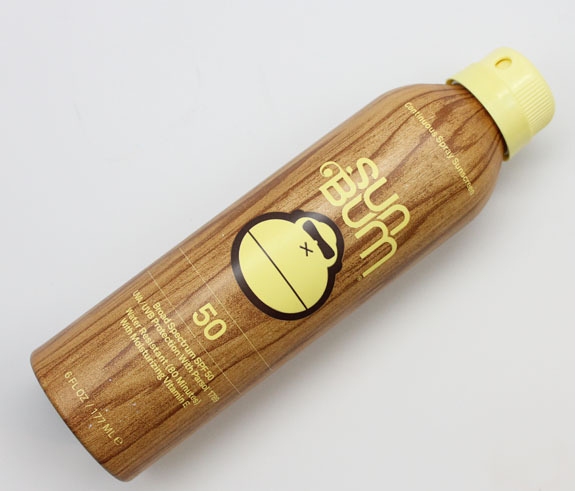 They come in a range of formulas (lotion, spray, stick and lip balm) as well as SPF – from 15 to 70. Because I am not super partial to sunscreen sprays, the SPF 50+ Moisturizing Sunscreen Lotion is the one I used for the trip most of the time. 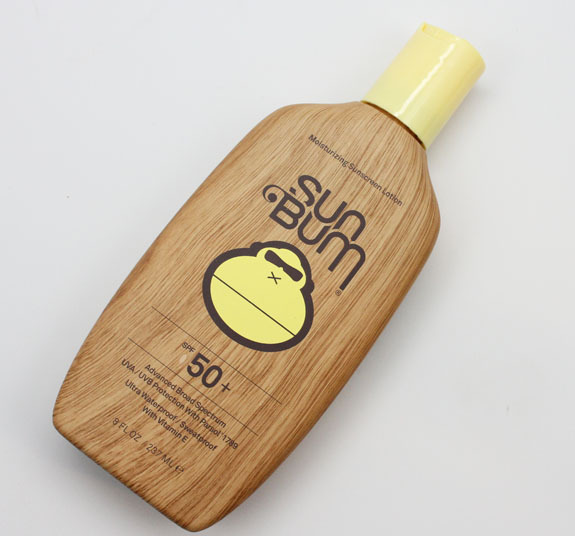 It comes in a good sized bottle (8 oz) and provides UVA/UVB protection with Parsol 1789. It’s also waterproof and sweatproof, paraben free, PABA free, hypoallergenic, contains vitamin E and smells deliciously like coconut. What I like about this lotion is that it applies and feels more like a moisturizing lotion rather than a typical sunscreen lotion. No stickiness, no whitening effect on the skin and it rubs in really easily. It definitely feels moisturizing and it never felt heavy or gross on my skin. Sometimes I feel like I need a shower after a couple hours when I apply sunscreen all-over, but not with this one. There is one negative that I noticed though. After being outside sweating a lot, it would tend to “pool” in areas like the crease of my arm or back of my knees. And if I rubbed an area it would kind of ball up and look like dirt or something. It did faithfully stay on though through all the sweating (BUCKETS) I did and the water-rides, one of which I got completely, absolutely soaked on (Kali River Rapids in Animal Kingdom). 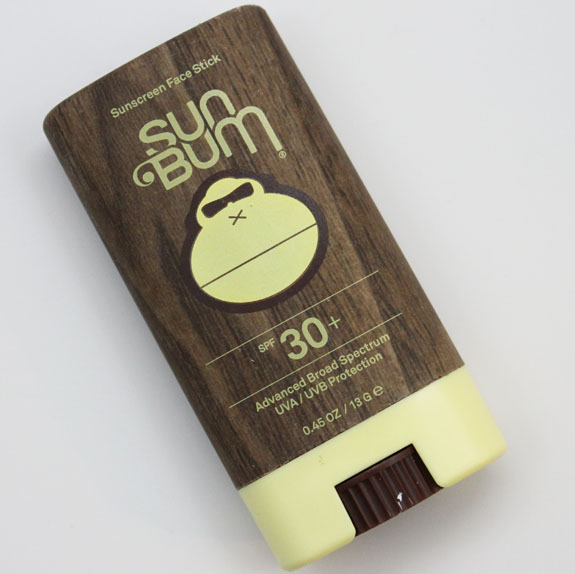 The SPF 30+ Face Stick comes in a small convenient twist-up stick. I like this because it’s super light, easy to carry and not messy at all. It has all the same benefits as the lotion as well. The texture is a little weird because it’s kind of dry (waxy-ish) so you almost feel like you aren’t really applying it. After a minute of rubbing it we finally got it to feel like it was coming off onto the skin. It’s clear so it’s not as easy to tell where you put it. It does work great for places like backs of hands, your nose/cheeks/forehead and ears! The SPF 50 Continuous Spray Sunscreen was Mr. VV’s sunscreen of choice. Partially because it’s so easy to apply, but partially because he makes ME apply it on him! This one also features a paraben and PABA free formula, vitamin E, Parsol 1789 and is waterproof and sweatproof. I love that the nozzle truly does give a nice, even continuous spray without ever clogging or bursting out. It’s super easy too use, just spray a fine mist all over and be done with it. I think it might feel a little stickier than the lotion though. Also with sprays it’s best to apply them outside because they leave a heavy cloud in the air. I love that the can itself is really lightweight and easy to carry. It also has a locking mechanism on the cap so if it’s in your bag, it won’t accidentally go off. Mr. VV used this most of the trip and it lasted until 2 days before we left. So it’s great for a week or so. He didn’t use it on his face though, we used something more face-friendly. Overall: I liked this brand quite a lot. I would definitely use it again because it did what it said it would and it felt comfortable on. I like the light coconut scent also. Neither myself or Mr. VV got ANY color whatsoever during the entire trip, which means it works. I never actually used the Cool Down Aloe Vera Spray shown in the photo above because I never felt I needed it. If I use it in the future though I’ll let you know how it fares. Pricing: Lotion ($15.99 for 8 oz), Face Stick ($9.99 for 0.45 oz), Spray ($15.99 for 6 oz). What is your go-to sunscreen brand?